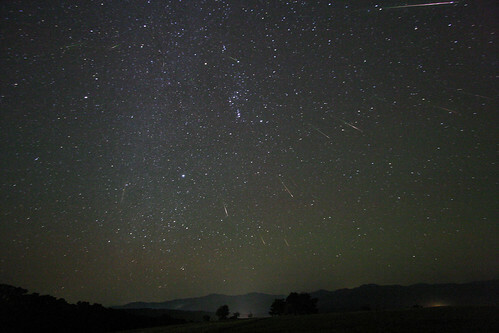 The Orionids were frequently observed during the latter years of the 19th century and became the focus of debate during the first quarter of the 20th century. The British amateur astronomer W. F. Denning and the American astronomer C. P. Olivier began using the pages of two astronomical periodicals to debate whether the Orionid radiant, the point from which the meteors seemed to radiate in the sky, moved from one day to the next: Denning argued that it did not, while Olivier argued that it did. Each astronomer had supporters that chimed in, but the argument remained essentially theirs. The problem was that the Orionid radiant was more diffuse than the other well-observed annual meteor showers. Thanks to the use of photography and the very precise plotting of meteors by several amateur and professional astronomers, Oliver was eventually proven correct. One very unusual feature the Orionids tend to display is an unpredictable maximum. In 1981, observers reported very low rates of less than 10 meteors per hour during the period of October 18 to 21 (maximum predicted for October 21), but high rates of near 20 per hour were noted on the morning of October 23. Interestingly, a study published in Czechoslovakia during 1982, revealed the Orionids generally exhibited a double maximum. The finding was based on observations made during the period spanning 1944 to 1950. Shortly thereafter, several visual studies indicated the presence of a "plateau effect" or a long period of maximum devoid of any sharp decline of activity, instead of a double peak. Most notably, the 1984 observations of the Western Australia Meteor Section, show a nearly flat maximum lasting from October 21 to 24, while N. W. McLeod, III (Florida, USA), has frequently noted it to stretch up to 6 days. The Leonids, due next month, are more frightening to satellite operators. Especially this year. This entry was posted on Wednesday, October 21st, 2009 at 7:22 am	and is filed under Space Tourism. You can follow any responses to this entry through the RSS 2.0 feed. You can leave a response, or trackback from your own site.